To Cite: Rinaldi L, Valente G, Piai G. Serial Liver Stiffness Measurements and Monitoring of Liver-Transplanted Patients in a Real-Life Clinical Practice, Hepat Mon. 2016 ; 16(12):e41162. doi: 10.5812/hepatmon.41162. Background: Liver transplanted patients need close surveillance for early signs of graft disease. Objectives: Transient elastography can safely be repeated over time, offering serial liver stiffness measurement values. Serial stiffness measurements were compared to single baseline stiffness measurements in predicting the appearance of liver-related clinical events and guiding subsequent clinical decisions. Methods: One hundred and sixty liver transplanted patients were observed for three years in our real-life practice. Results: Liver stiffness measurements were stable in 75% of patients, decreased in 4% of patients, and increased in 21% of patients. The pattern of increased stiffness measurements was associated with both HCV-RNA positive status and the presence of an active biliary complication of liver transplantation and was more predictive of a clinically significant event resulting from any disease of the transplanted liver when compared to a stable pattern or to a single liver stiffness measurement. The procedures that were consequently performed were often diagnostic for unexpected situations, both in HCV-RNA positive and HCV-RNA negative patients. Conclusions: The pattern of longitudinally increased liver stiffness measurements efficiently supported clinical decisions for individualized management strategies. Repeated transient elastography in real-life clinical practice appears to have a practical role in monitoring liver transplanted patients. Liver transplantation has progressed to become an acceptable means for the treatment of end-stage liver disease, and survival outcomes have dramatically improved over the years. The challenge of managing thousands of liver transplant survivors, surely still increasing in number, is common in all developed countries. Management of liver transplanted patients (LTPs) aims to prevent and treat any graft disease as well as to improve the quality of a patient’s life. During post-transplant follow-up, transplant hepatologists routinely carry out a large variety of laboratory and instrumental controls to identify graft damage. Morbidity and mortality are closely related to liver fibrosis development during the process that leads to cirrhosis and end-stage liver disease. Liver biopsy still has a central role in this process: to grade fibrosis, to exclude a rejection phase, and to predict the course of liver graft disease by identifying several different etiologies (1). However, liver biopsy has substantial limitations, including sampling error, intra- and inter-observer variability, infrequent but potentially severe complications, and significant costs (2). Thus, alternative non-invasive tools have also been introduced into the liver transplant setting for the detection of graft fibrosis (3). Vibration-controlled transient elastography (VCTE) is a “user-friendly” and non-invasive technique that measures liver stiffness, a parameter primarily related to the degree of liver fibrosis. It is regularly used because fibrosis is a common element of progression for all chronic liver diseases from any cause. Liver stiffness measurement (LSM) (using the Fibroscan® device) has been shown to accurately predict liver fibrosis severity in patients with a variety of clinical conditions, even if the LSM may be influenced by several factors in addition to fibrosis, including hepatitis-associated necroinflammatory activity (high cytolysis), cholestasis and vascular congestion (4), steatosis (5), measurements in post-prandial status (6), and extrahepatic obstructive cholestasis (7, 8). All of these factors can lead to a misdiagnosis of the “fibrosis” that is present. However, the combination with serum marker of fibrosis can increase the usefulness of the LSM in clinical practice, although with a potential increase of costs (9). Despite these intrinsic limitations, the use of LSM was introduced both in Europe and in the USA with an explicit role in the evaluation of transplanted liver (10, 11). One of the advantages of LSM compared to liver biopsy is that it can easily be repeated over time, as a routine or on-demand procedure, offering repeated serial values. The basic hypothesis of the present study is that such consecutive values may define the trend of the LSM value over time (increase, stability or decrease) within the same case. In this study, we evaluated the role of VCTE serial LSMs in monitoring LTPs, detecting the presence of graft damage and selecting those LTPs needing liver biopsy or any other procedure. Two hundreds and twenty-six patients, all transplanted (222 with cadaveric whole livers and 4 with split livers) in centers far from our peripheral liver unit (Torino 116, 51%; Pisa 27, 12%; Padova 18, 8%; other Italian centers 38, 17%; foreign centers 27, 12%), were followed and constantly monitored by usual laboratory tests and ultrasound studies of vascular arterial and portal venous flows. The main inclusion criterion in the present study was to have been evaluated at least three times by VCTE, performed in our unit, between September 2011 and September 2014. Sixty-four LTPs were then excluded because of the absence of at least three LSMs in 17 cases (26%), death in 23 (36%), dropout in 18 (28%), unsuccessful LSM for obesity with thickness of the thoracic wall in 3 (5%) or for ascites in 3 (5%). VCTE was routinely performed at 6-month intervals, or shorter if indicated by clinical suspicion of an illness such as an increase in indices of cytolysis or cholestasis. Elastographic measurements were performed using the Fibroscan® M probe (Echosens, Paris, France) following the standardized procedure (12) after at least 12 h of fasting. The results were expressed in kilopascals (kPa), and a median value of 10 acquisitions was considered for analysis. LSM was assessed for reliability by interquartile range/median ratios (IQR/M) and was assessed as “very reliable” or “reliable” according to Boursier et al. (13). The procedures were performed by two independent investigators (L.R. and G.V.) who had undergone, before September 2011, a previous training period in which each of them had executed more than 100 VCTE measurements. On the pragmatic assumption that the first observation of a clinical control attempts to detect a significant sign of graft disease, patients were classified after their first LSM as having significant fibrosis (≥ F2 Metavir) or cirrhosis (F4 Metavir). LSM cut-off values were arbitrarily chosen for this paper according to previously published data (14): < 7.1 kPa defined the normal/mild fibrosis group; ≥ 7.1 kPa defined the group with significant fibrosis (≥ F2); and ≥ 12.5 kPa defined those with cirrhosis (F4). An “increased over time” change in LSM value (IOT-LSM) was defined as significant when, in three or more measurements performed at least 3 months apart, we observed a 20% change ≥ 2 kPa from the basal value and if the last measurement was > 7.1 kPa. A “decreased over time” LSM (DOT-LSM) was defined when, in three or more measurements performed at least 3 months apart, we observed a 20% reduction ≥ 2 kPa from the basal value irrespective of the last measurement. Patients who did not meet these definitions were classified as “stable” (SOT-LSM) (i.e., their successive LSMs were not significantly different from the baseline LSM). Diagnosis of chronic liver disease was made by standard criteria, and HCV reinfection was defined by detection of HCV RNA in serum samples after liver transplantation. In addition, a liver biopsy was performed to stage and grade the disease and to exclude other concurrent disorders. The outcome “occurrence of liver cirrhosis” was either diagnosed by liver histology or, when no liver biopsy was available, by evident signs of cirrhosis in ultrasound/endoscopic investigations (in all cases of suspected cirrhosis, an upper GI endoscopy was performed). Ascites, variceal bleeding and encephalopathy were all contained within the category called “decompensation”. The composite item “clinical event” indicates a more composite outcome (decompensation + diagnosis of cirrhosis and liver-related death). The item, arbitrarily defined in this paper as “biliopathy”, generically defines the broad spectrum of diseases of the entire biliary tract, including intrahepatic and extrahepatic bile ducts, that may occur after a liver transplant. The results are presented as median values (range) for continuous variables and as percentages for categorical variables. Chi-square or Fisher’s exact tests were used to compare categorical variables, and differences between unpaired quantitative variables were analyzed by the Mann-Whitney test. A P < 0.05 was considered to be significant. A simple scatterplot was used to determine whether a relationship between kPa measured with VCTE at baseline and kPa measured the time after liver transplantation was present. 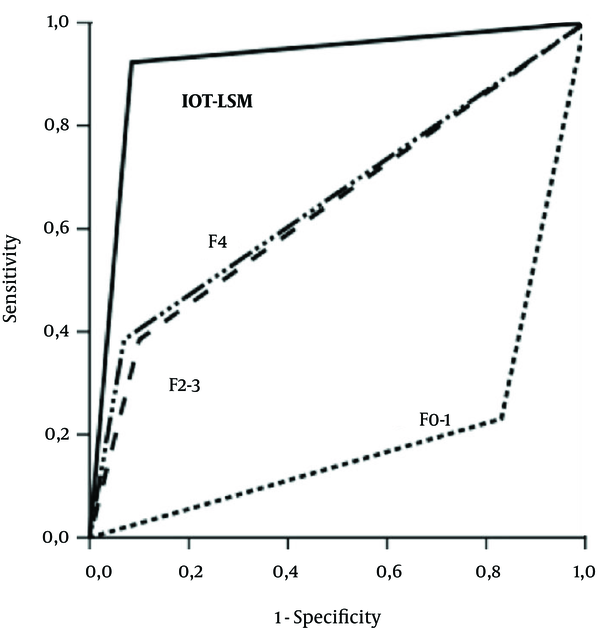 Host-related features that showed statistically significant differences between SOT-LSM and IOT-LSM were entered into a multivariable binary logistic regression analysis to assess their relationship with IOT-LSM. Additionally, another binary logistic regression analysis to assess variables associated with the F4 stage at baseline was performed. Diagnostic values to predict the occurrence of an adverse outcome of IOT-LSM and baseline values of fibrosis classified by VCTE were assessed by calculating the areas under the receiver operator curve (AUROC). The sensitivity, specificity, positive predictive value (PPV) and negative predictive value (NPV) were also determined to assess the accuracy of predetermined IOT-LSM status. 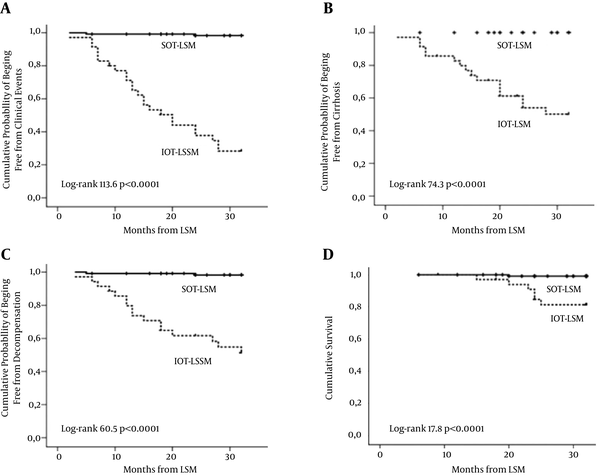 The ability of SOT-LSM and IOT-LSM to predict the development of graft cirrhosis, liver decompensation and graft/patient survival was assessed with Kaplan–Meier curves using log rank tests; censored cases are included in the curves. Data were censored on the date of the last visit or occurrence of adverse outcomes, defined as death or ascites. Deaths for causes other than those that were liver-related were considered as censored. Statistical analyses were performed with SPSS 13.0 software (SPSS Inc., Chicago, IL, USA). The nature of the study was explained to the patients, who provided written informed consent before entry into the study, or, when they could not be contacted, their data were analyzed in a blind fashion, in accordance with the principle of the Declaration of Helsinki (Edinburgh revision, 2000). One hundred and sixty-two liver transplanted patients (LTPs) had at least three valid longitudinal LSMs, each at a maximum of a 6-month interval, during the 3-year period of the study. One hundred and twenty-four patients (76%) were male. The median recipient age was 54 years at LT (range 18 - 67) and 60 years at first LSM (range 27 - 70). Causes of liver disease leading to LT were HCV alone (n = 60, 37%), HBV or HBV/HDV (n = 59, 36%), alcohol (n = 13, 8%), and others (19%: 12 co-infected HCV/HBV, 4 HCV/NAFLD, 4 HCV/alcohol, 4 non-alcoholic steatohepatitis, 4 cholestatic liver disease, 1 polycystic liver, 1 liver adenomatosis). Immunosuppression included steroids in all patients who were evaluated for the first time during the first 6 months after LT (23, 14%). Cyclosporine and tacrolimus were combined to mycophenolate (mofetil or sodium) in 77 patients (47%). Mycophenolate was given as monotherapy in 8 patients (5%). LTPs had basal LSMs over a broad range of time after their liver transplant (2-252 months, median 60 months) when they started to be monitored at our center; this was expected because of the unselected composition of the cohort. The allocations of LSM at first determination after LT in Metavir F0-F1, F2-F3 and F4 stages were 114 (70%), 24 (15%) and 24 (15%), respectively. Statistically significant differences were found between F4 and non-F4 groups with a higher presence of virus C and diabetes and higher values of ALT in F4 groups. After binary logistic regression analysis, only hepatitis viremic C status was identified as the independent variable (p=0.03). Additionally, the baseline LSM was not related to the time elapsed since transplantation (p=0.68), as shown in Figure 1. LSM, liver stiffness measurement; LT, liver transplantation. 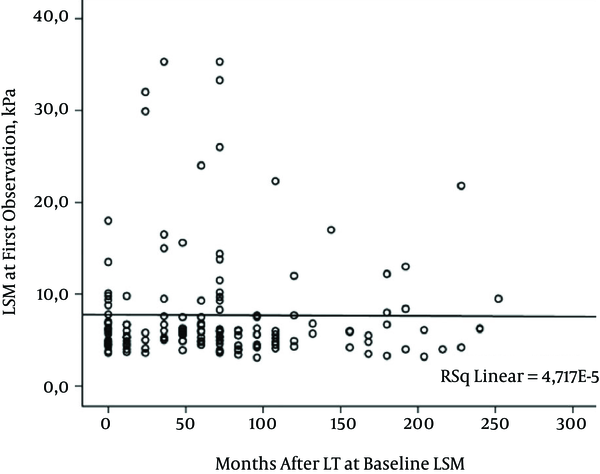 Repeated serial LSM remained stable over time (SOT-LSM group) in 121 patients (75%), while 35 (21%) LTPs showed a significantly increased kPa over time (IOT-LSM group). Only 6 out of 162 (3.7%) transplanted patients in our cohort met the definition of DOT-LSM. Stable and increased LSM groups differed in several aspects, as shown in Table 1. The IOT-LSM group had more severe fibrosis at baseline with respect to the SOT-LSM group; the allocation according to Metavir F0-F1, F2-F3 and F4 of first baseline LSM was 100 (83%), 12 (10%) and 9 (7%) in the SOT-LSM group and 14 (40%), 11 (31%) and 10 (29%) in the IOT-LSM group (P < 0.0001, P = 0.002, P = 0.001, respectively). Table 1. Demographic and clinical characteristics of the 156 patients included in the study (4 LTP with decreased over time LSM were excluded). LSM, liver stiffness measurement; SOT-LSM, stable over time LSM; IOT-LSM, increased over time LSM; LT, liver transplantation; LTP, liver transplanted patients; BMI, body mass index; ALT, alanine aminotransferase. IOT-LSM was more frequently observed in patients transplanted as a result of HCV-related disease (80%), still replicating HCV (71%) and in patients with higher transaminases (60%), while it was more rarely seen in those transplanted as a result of HBV-disease (17%, P < 0.0001). A cyclosporine immunosuppressive regimen was administered more frequently in IOT-LSM (49%) than in SOT-LSM patients (29%, P = 0.03); these cyclosporine-treated patients had a graft older than those treated with other drugs (88 months vs. 73 months, p=0.043) and had a lower prevalence of diabetes (17% vs. 83%, P = 0.016). After binary logistic regression analysis, some variables maintained an independent value: hepatitis C viraemia (P = 0.002), abnormal ALT (P = 0.002), biliopathy (the appearance of a post-transplant biliary complication) (P = 0.004) and cyclosporine immunosuppression (P = 0.009). DOT-LSM was observed in 6 of our LTP cases, 1 after successful dual antiviral therapy of recurrent HCV-related cirrhosis, 1 after “compassionate use” Sofosbuvir Daclatasvir-based HCV therapy, 1 patient after audit and prolonged abstinence from alcohol, 1 after resolution of a long-standing obstructive biliopathy, 1 after re-introduction of immunosuppressive therapy previously stopped by the patient himself, and 1 with an idiopathic (NAFLD?) post-transplant cirrhosis. The incidence of a clinical event in the whole group during the 2.5 years of observation was 16% (26 out of 162 LTPs) at a median time of 84 months after LT (range 6-126). Sixteen patients (10%) met the definition of cirrhosis (development of new cases), 18 (11%) had hepatic decompensation (16 in patients with cirrhosis diagnosed during follow-up and 2 in patients with cirrhosis at baseline), and 7 (4%) died from a liver-related cause. Figure 2 shows cumulative probabilities of different possible clinical events with Kaplan-Meier curves according to SOT-LSM or IOT-LSM status. IOT-LSM, increasing over time liver stiffness measurement; SOT-LSM, stable over time liver stiffness measurement; F0-1, absence or minimal fibrosis; F2-3, significant-advanced fibrosis; F4, cirrhosis. The diagnostic performance of classifying a patient according to dynamic LSM as SOT-LSM or as IOT-LSM is shown in Table 2. The incidence of a clinical event was shown in 2 cases (1.6%) in the SOT-LSM group and in 24 cases (68%) in the IOT-LSM group (P < 0.0001), with specificity and sensitivity both > 91%. Part B of the table shows that the small number of liver-related deaths observed (7, all with HCV-related disease) included 6 in the IOT-LSM group and 1 in the SOT-LSM group. A stable LSM has a very high negative predictive value for both a clinical event and death. Table 2. Liver stiffness measurement (LSM) to predict a clinically significant event: diagnostic performance of a stable LSM (SOT-LSM) or an increasing over time LSM (IOT-LSM), for all together events (diagnosis of cirrhosis, liver decompensation and liver-death) (A) and for only liver-deaths (B). Abbreviations: KPa, kilopascals; NPV, negative predictive value; PPV, positive predictive value; Se, sensitivity; Sp, specificity. LSM performance in predicting the presentation of a clinical event is shown in Figure 3. The best overall area under the receiver operating characteristic curve (AUROC) is that of IOT-LSM (0.919), while the prediction of a clinical event based on each of the SOT-LSM F0-F1, F2-F3, and F4 stages was significantly lower in all comparisons (AUROC 0.200, 0.642, and 0.658, respectively). Figure 3. Kaplan-Meier curves for cumulative probabilities of overall clinical events (A), development of cirrhosis (B), decompensation (C) and cumulative survival (D) in groups with SOT LSM/IOT LSM. LSM, liver stiffness measurement; IOT-LSM, increasing over time liver stiffness measurement; SOT-LSM, stable over time liver stiffness measurement. Evidence of LSM values evolving over time prompted us, in our LTP management, to perform several procedures that led to several diagnoses, some unexpected, as shown in Table 3. In two cases, IOT-LSM suggested a liver injury despite normal or trivial results of biochemical tests, and a liver biopsy showed severe fibrosis. In one case with a baseline LSM suggestive of F4 fibrosis and IOT-LSM, the liver biopsy showed an F2 fibrosis; this patient developed ascites during the follow-up, confirming the LSM result. One patient, with recurrent cholangitis episodes that were sometimes clinically severe, showed a gradual significant increase of baseline LSM (6 kPa versus 8.7 kPa); imaging did not diagnose a definite pathology of extra-hepatic ducts, and a liver biopsy showed severe chronic rejection. aDiagnosis of cirrhosis derived from evidence of esophageal varices at upper endoscopy in 5 cases and from histology at liver biopsy in 1 case. bDiagnosis led to anticipate, when possible, the antiviral therapy. cDiagnoses by C-RM and ERCP. dOne patient himself suspended the anti-reject therapy. eOne patient always denied this possibility before liver biopsy. The present single-center study evaluated the significance of liver stiffness measurements repeated over time to monitor liver-transplanted patients as an aid in defining their management modalities in a routine clinical setting. The studied population is very heterogeneous, reflecting the unselected characteristic of the real world; our LTPs derived from several surgical transplant centers mostly located far from our region, reflecting similar situations in other countries, and with different management concerning immunosuppression, complications, HCV antiviral therapy, etc. Many peripheral specialized liver units, which are not liver transplantation centers, are currently ensuring patients of the presence of a qualified reference point that is a short distance from their residence, in coordination with transplant centers that evidently remain an essential point of reference in their global management. Long-term results of a transplanted liver rely on fibrosis accumulation, the pathway that is common to most chronic liver graft injuries, particularly well defined in the context of recurrent hepatitis C (10). Monitoring of fibrosis development therefore appears to be a cornerstone in clinical practice. Liver biopsy remains the reference standard for evaluating the extent of liver fibrosis, especially in liver transplants, even if it is invasive, expensive, sometimes subject to measurement error, and not easily repeated (14, 15). LSM via VCTE, between several alternative non-invasive methods (16), has shown good diagnostic accuracy for both fibrosis and cirrhosis with portal hypertension (17) and is associated with the risk of decompensation, liver cancer, and death in patients with chronic liver disease (18) and after LT (19). Several factors other than fibrosis have been shown to affect a baseline, episodic, VCTE-measured liver stiffness with limitations that can lead to misestimating the actual “fibrosis”. These factors may have contributed to preventing the ability to reach a consensus on LSM cut-offs that are able to distinguish a normal liver from a liver with significant fibrosis and from a cirrhotic liver in the different etiologies of liver disease. In our study, baseline measurements of liver stiffness were performed at different time intervals after LT; we unexpectedly found that the baseline measure was not related to time since LT. Stiffness evolution is most likely influenced by this time interval in many patients, but single cases are diluted in our whole heterogeneous studied population. One of the advantages of VCTE compared to liver biopsy is that it can easily be repeated over time, as a routine or an on-demand procedure, offering repeated “dynamic” LSM values. Furthermore, such consecutive values define new parameters of the trend over time (increase, stability, or decrease) of the LSM value; thus, as reported by Malekzadeh et al. (20), the repeated assessments allow the monitoring of the evolution of the chronic liver disease, as the response to treatments. We used a stringent criterion for defining an IOT-LSM as “significant”, accepting only a very wide variation, similar to the definition applied by Christiansen et al. (21) that should overcome the limitations of variable cut-offs. The test, applied to individual cases, should not depend on the starting kPa value. This serial evaluation of LSM values tries to render a continuous variable categorical; it allows increasing sensibility of the method but costs decreased specificity. We think that this is quite suitable for the context of patients who are followed after liver transplantation who need close surveillance mainly because of their immunodepression status or their frequently present accompanying chronic diseases. The main result of our study is the assessment of the relationship between serial changes in LSM and the development of clinically relevant outcomes in a transplanted liver; all our cases with a significant increase in kPa values in at least two controls have resulted in the detection of hepatic damage in the liver biopsy or in a clear expression of cirrhosis clinical development. An LSM value that increases over time represents a simple indication, which is more valuable than a point-determination of LSM, of the subsequent occurrence of a clinically significant event. In contrast, an LSM value that decreased over time was observed in all cases with fibrosis and necroinflammation regression as demonstrated in the case of healed chronic hepatitis C (22, 23). In this study, IOT-LSM was related to obvious signs of liver disease, such as abnormal values of ALT, replicating HCV, and biliopathy but was also related to unexpected factors such as cyclosporine treatment. Cyclosporine-treated patients were those with an older graft, a lower presence of diabetes mellitus, and a longer duration of liver transplantation. In the last decade, tacrolimus has become more used because of the evidence that immunosuppression with tacrolimus reduces mortality at 1- and 3-years post-transplant, in addition to reduced graft loss, reduced rejection and steroid-resistant rejection (24). However, the diabetogenic potential of tacrolimus is much higher than that of cyclosporine, as shown by a systematic review on post-transplantation new-onset diabetes mellitus (25). A series of increasing LSM values does not allow a specific diagnosis but indicates that an accurate diagnosis must be pursued because it signifies a progressive pathological process in the liver that could lead to a clinical event. We suggest deepening in any mode (biopsy or any other procedure, increasing blood controls even if normal, increasing immunosuppression, etc.). The potential limitation of VCTE to be affected by factors other than fibrosis can be its strength in the context of surveillance. Liver biopsies in our alarmed patients led to different diagnoses, such as graft liver damage, a rapid increase in fibrosis from re-infection by HCV, or overlapping conditions. These occurrences have been evident also in healed HCV and in non-HCV LTPs who usually show a more stable clinical course over time. Thus, the information from VCTE is quite different and is not substitutive of that from a liver biopsy; the two methods are not in competition with one another. Other studies have already shown that some serial changes in LSM may potentially add something to the prognostic utility of this technique in different settings. A meta-analysis of LSM as a predictor of complications (17) calculated a 22% increase in mortality for an increase in baseline LSM of one unit of kPa. Vergniol et al. (26) showed the strong prognostic value in CHC patients of repeated LSM, expressed as delta kPa/year (follow-up result–baseline result/time interval between the two measurements). This is an approach that is different from ours but with the same concept of the importance of detecting an evolution of LSM. The relationship of an increase in LS has also been observed in patients with primary biliary cirrhosis (27) and in HIV-HCV co-infected patients (28). In conclusion, our results suggest that VCTE, in the particular context of a transplanted liver, can evolve from its role as a diagnostic test to a surveillance procedure that actively helps in the management of patients with the highest need of vigilance, so that it can be stably used as an additional tool in clinical practice. Authors’ Contribution: All Authors equally contributed to research design, to data management and to drafting and revising the paper. Luca Rinaldi and Giovanna Valente received support in part by grants from Progetto SATTE -Regione Campania (DGR 1389/2009) and from AITF (Italian association of liver transplanted patients) - delegation of Caserta. Guido Piai has acted as advisor for Roche, Grifols and Abbvie.